Death of Wolverine #3 Review! "Seppuku"
Here we are, only one issue away from Wolverine’s actual death. As always with these specific reviews, there will be a ton of SPOILERS, so read on at your own risk. Lets jump right into this penultimate issue of this four part mini-series. First of all, the title evokes a certain air right off the bad. Seppuku is a form of Japanese ritual suicide, most commonly done with a small blade through the stomach. Brutal right? So immediately we get a sense of urgency and finality in this story, without even getting to the first page. 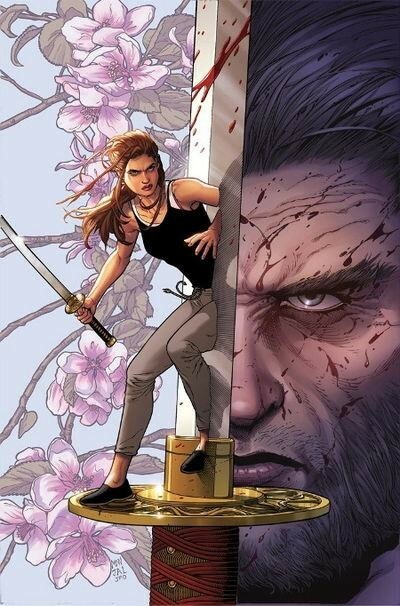 The cover depicts Kitty Pryde, phasing through a sword, with a sword in her hand. This cuts the background in two, with half of Wolverine’s beaten and bloody face next to the beautiful dichotomy of the plum blossoms he loves in Japan. As always, the artistic team of Steve McNiven, Jay Leisten and Justin Ponsor create an awesome cover with gorgeous panel work within. This issue picks up right where we were left, with Kitty’s hand phased through Lady Deathstrike’s chest. Some nice action sequences ensue, and a few panels later Deathstrike is in the wind, and Wolverine faints to the ground, from the wounds he sustained fighting Sabertooth and Deathstrike last issue. Kitty gives him some regen serum to help him back on his feet, and heal his wounds. Now Wolverine knows that his mentor, and Kitties, Lord Ogun, is behind some of what has befallen Logan, and he vows to go after him, and Kitty volunteers to help. Gorgeous panel work, with great dialogue between Kitty and Logan really hammer home that this is the final time that we might see these characters together, at least for a while. But that feeling is fleeting, as Kitty is revealed to be actually a vessel for Ogun, and Wolverine immediately fights her/him off. 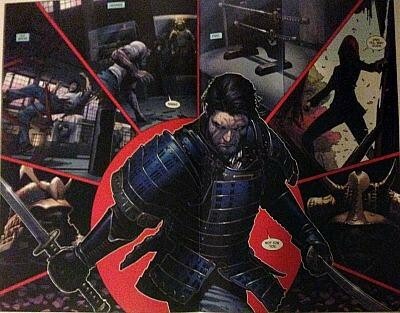 A absolutely great two page spread revealing Wolverine in old samurai armor harkens back to the old days of the character, and is stunning. Kitty, and Logan, manage to drive Ogun out into another host, and he tracks him down to a shady factory outside of town. 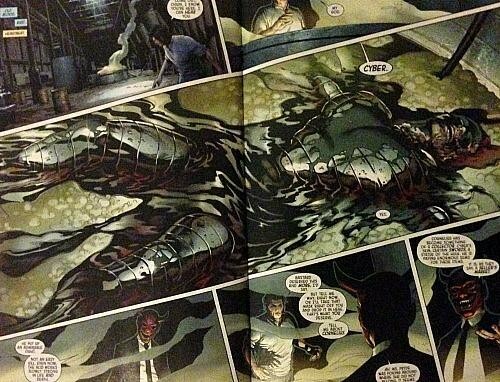 The final pieces are revealed, as another one of Wolvie’s foes, Cyber, lies dead and being dissolved in acid. Kitty tells Wolverine that she heard a name, Abraham Cornelius, and Ogun confirms this. This man is solely responsible for bonding the adamantium to Logan’s bones in the first place (See Marvel Comics Presents Weapon X storyline), as well as resurrecting Omega Red. Thought to be dead at the hands of Wolverine’s ally Maverick, he has seemingly returned and Wolverine is now gunning for him. It looks like this whole arc is coming as full circle as it can with all of Wolverine’s past, which will make for a great overall story cap. The final thought, is on what Ogun offers Wolverine. He has three more vials of regen serum, and will give them to Logan if he just leaves him alone. Now, granted, this could be a trap. But as Kitty, Ogun showed that the vials are real. Wolverine refuses, and most likely the right move, but still seals his fate. In that one choice, he almost has a hand in his own death, but only the next issue will tell us all for sure. This book just looks and feels great. The art is well produced, the dialogue is interesting, and the twists and turns feel fresh, even though they are dealing with ghosts of Logan’s past. Old Bones, as he puts it. It does it’s job thoroughly by making the reader chomp at the bit for the final issue. For anyone that is familiar with the history that Kitty, Wolverine and Ogun have, I felt that this was rushed. I would have like to have seen Ogun appear earlier in this mini series, to give him more panel time, and more interaction with Wolverine. I like the way it was handles, I just wanted more. CBH Score: 5 out of 5. Bring on the end.